The Atelier de Joel Robuchon was the idea of world renowned French chef Joel Robuchon and opened up as a top table restaurant in Paris within the 5 star Hotel Pont Royal where you can enjoy Michelin star excellence, either sitting at the bar watching the chefs prepare your meal at the open kitchen, or in a more traditional table setting for a gourmet fine dining experience. Hailed as one of the greatest chefs in France, Joel Robuchon originally retired in 1996, but like many people who have such a passion, he did not rest for long, and after a while he decided to enter back on the scene and open a restaurant in Paris. An atelier is French for the Workshop, and he had an innovative and novel idea at the time of creating a restaurant that had an open kitchen, where you would sit on high bar stools seeing your gourmet meal prepared by the competent chef and his team. The place chosen was the Hotel Pont Royal in the Saint Germain des Pres area of the city, and being a 5 star hotel in Paris, this was the perfect setting for a Michelin starred gourmet experience, with the decor and open kitchen features being designed by Pierre-Yves Rochon. Opened in 2003, at the time, this small restaurant could only cater for 40 people at a time sitting on the high stools, watching their a la carte meal being created from the finest ingredients, right in front of their eyes. 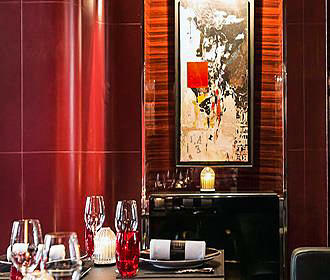 Yet with it being such a resounding success, the Atelier de Joel Robuchon was extended in 2013 to incorporate a salon, or dining room with a more traditional feel of proper dining tables and chairs as well. With a red and black colour scheme accentuated by wood for a contemporary, yet refined decor with an additional mix of Spanish and Japanese atmospheres along with a friendly feel, you can see things such as hams and bamboo plants hanging up from the ceiling. There are still the 40 seats surrounding the bar style serving counter area, which looks directly onto the open kitchen, although for a more traditional restaurant feel, you can now opt to sit at one of the dining tables in the small and cosy salon for a more intimate dining experience, and being rated a 2 Michelin star restaurant in Paris, you can be assured of a true gourmet a la carte experience, headed by the Executive Chef, Axel Manes. 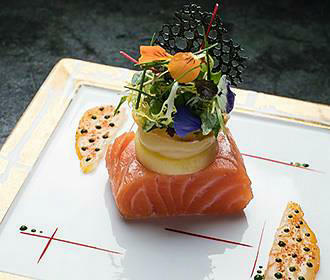 Authentic and uncomplicated cuisine, is something you can discover from the classics that are served at the Atelier de Joel Robuchon, with the menus changing according to the seasons and what produce is available from carefully selected producers, which amount to approximately 100 different recognised suppliers. 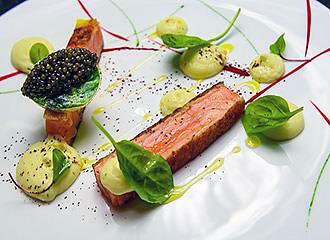 Whether you are thing about French delicacies of cuisine such as Foie Gras, black truffle, caviar, langoustines, Saint-Jacques or quail there is something to tempt any palette on the different menus at this restaurant located at the Pont Royal Hotel in Paris, all exquisitely presented for a memorable gourmet meal. 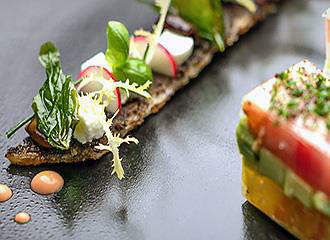 A menu called a Tasting Menu or Small Plate Menu provides you the option of choosing just one or two dishes to discover, for those of you who do not wish to have a full meal, yet would still like to experience the exquisite creations. Just some of the delights you may be able to get to experience on the Small Plate Menu include Eggplant confit in mille-feuille with mozzarella and basil, Anchovies fresh marinated grilled red peppers, The Shrimp, crunchy vermicelli with sumac and lime, Lagoustine in truffled ravioli with steamed green cabbage, The Burger with foie gras and its spicy sauce, Milk Lamb in chops with thyme flower, Pigeon supreme with cabbage and foie gras, Black Cod marinated with miso, crunchy cucumber on a smoked aubergine cream or Quail stuffed with foie gras and caramelized with a truffled potato puree, to name a few. You can opt for an a la carte menu, with hot or cold starters being delights such as Tuna confit on a lettuce heart garnished with crispy vegetables, Caviar on a boiled chicken egg and smoked salmon fondue, Ibeerico ham of Bellota, toast with tomato, Norwegian smoked salmon with a potato slice with chives and lemon juice or Hen in broth with fine ravioli of foie gras and spicy cream for example. Main courses at L' Atelier de Joel Robuchon could be Saint-Pierre grilled, zucchini flowers in an "ashes" ravioli, juice flavoured with Tandoori, Cod, fresh herb print with vegetable juices and basil, Milk lamb in chops with thyme flower, Black Angus its heart a la plancha, blown apples and spindles of caviar of aubergines, Calf liver with crispy onion rouelles and tangy juice, or Entrecote beef, dry aged, potatoes and "Padron" grilled on a griddle to name a few. Then of course there are the very tempting desserts, which are referred to as the Grand Finale, and these could be The Chocolate Temptation of creamy chocolate ganache Araguani, cocoa nib ice cream and Oreo biscuit, The Cherry in a crisp setting, its pistachio heart, Amarena and infusion with cherry blossom, The Pinapple roasted and its mille-feuille, creamy roasted pine nuts and caramel ice cream, The Coconut, its juice crystallized at -200 degrees C under an emulsion of fresh mango, lime and blackcurrant powder or a selection of freshly prepared tradition French pastries, for instance. However, for those of you who do not really know what to choose from on the menu, then you could always option for the Tasting Menu at L'Atelier Joel Robuchon, which is called the Discovery Menu and is a set meal of several courses to take you on a journey of discovery that will arouse all of your senses, with wine pairing also being an added option for the tasting menu. Talking of drinks, as you would expect from a Michelin starred restaurant, there are a wide variety of fine wines and champagnes on offer, some of which are available by the glass, plus you could also start off with an aperitif and end with a liqueur, etc. The choice is yours, whether it is for a memorable lunch or evening meal, with prices ranging from approximately €100 up to around €200 not including drinks, depending upon what you choose. 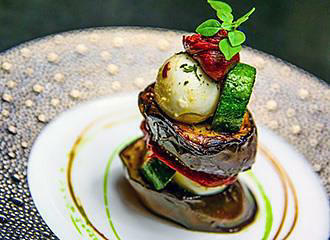 As we mentioned earlier, the Atelier de Joel Robuchon is located at the 5 Star Hotel Pont Royal, which can be accessed directly by the guests of the hotel, and this restaurant is responsible for all hotel catering, however, it is also open to people not staying at the hotel. You will find that this haute cuisine restaurant in Paris is open seven days a week between the hours of 11:30am and 3:30pm for lunch and between 6:30pm and midnight for dinner. 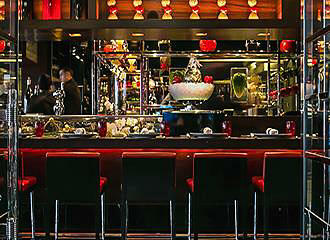 Reservations are a must of a lunchtime, due to the popularity and cosy atmosphere of L'Atelier Joel Robuchon, which can be organised by telephone or online at the dedicated website, and reservations are also taken for the first sitting of an evening, but after that, it is pot luck whether you are able to enjoy this haute cuisine restaurant or not. Although it has an informal style, smart dress is required, however, you may be pleased to know that this restaurant is accessible to the disabled, plus your beloved pet dogs are also welcome, and if you are arriving via your own vehicle, then even valet parking is available. Located on the Left Bank of the River Seine in the 7th Arrondissement of Paris at the distinguished Hotel Pont Royal, it is situated in the heart of the Saint Germain des Pres area only a short walk from popular tourist attractions in Paris such as the Musee d'Orsay and the Musee Maillol. Even though valet parking within a secure car park located opposite L'Atelier de Joel Robuchon is available, if you are travelling to this restaurant via public transport in Paris, then there are several options to choose from within walking distance. To start with, the nearest Metro station is the Rue du Bac stop located in a south westerly direction serving line 12, yet a little further in a south easterly direction and you have the Saint-Germain-des-Pres stop serving line 4. If you are travelling via the RER trains, then the nearest RER train station is the Gare Musee d'Orsay serving the RER C line. Yet the Paris bus lines 24, 39, 63, 68, 69, 72, 73, 83, 84, 94 and 95 along with the Noctilien Night Bus Service via lines N01, N02, N11, N12, N13 and N24 will also get you within easy walking distance.